The Thai green tea is very different from Japanese and Chinese (usually hot) green tea. The Thai drink is light green and completely opaque. I read that Thais use "green tea powder", condensed milk, "oriental spices", crushed ice and more to produce this shake. When I drink this I remember having been served "similar" in Japan. Opaque, green tea in small clay cups. Much more filled with "small particles" than is "normal" tea. It was hot and not sweet, at least as I remember. When I Google I just find entries like Oolong tea which is not what I am looking for. Oolong tea is clear and more resembles traditional tea. My question mostly relates to what I have had in Japan. What is this brew that is green but differs very much from "normal" green tea by being opaque? If it's "green tea powder" it's probably matcha. The traditional Japanese tea ceremony centers on the preparation, serving, and drinking of matcha. 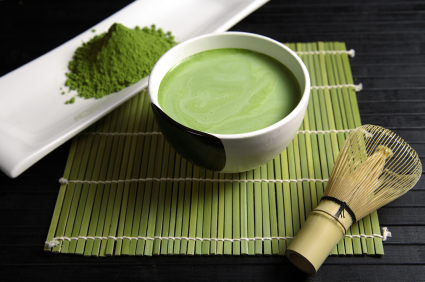 In modern times, matcha has also come to be used to flavour and dye foods such as mochi and soba noodles, green tea ice cream and a variety of wagashi (Japanese confectionery). The drink you had in Thailand is probably an iced matcha shake of some sort, made with condensed milk. In Japan, the drink is served by itself as part of tea ceremonies and is opaque even without milk added to it. There's a guide to how tea ceremonies work and the process of making tea here, if you're interested. It's originally from China, but it's most often thought of as a Japanese tea. They dry the tea leaves and then pulverise them to form a powder. Because it's a powder it doesn't get strained after brewing, which is why it's .. grittier than tea leaves that then get strained out. The higher the quality of the matcha, the less gritty it will be, it'll be smoother, almost creamy.